The following is the text of an email (16 September 2014) from the Matterport Team announcing the Matterport 3D Capture App 2.0 update. We're excited to let you know about Matterport 3D Capture App 2.0, available in the Apple App Store on Wednesday, September 17. In response to your feedback, we’ve added a number of new features to Capture and updated the user interface. Label Multiple Floors. We’ve added a feature that lets you scan up stairs and label floors. Duplicate and Delete Models. You can now duplicate and delete Models on the iPad. Re-upload Models. Models can be edited and uploaded again. You can add new Scans to the Model, and you can add or edit windows, mirrors, and trim mark-ups. Faster Capture. Data transfer and alignment now happen independently which allows you to move the camera to a new position sooner and capture spaces faster. Global Alignment. Scans now align to each other automatically so you don’t have to manually select an active scan to align to. B) Install Capture App 2.0 on a second iPad so you have access to the current version of Capture if you encounter problems with Capture 2.0. Bluetooth connection drops if you move the iPad too far away from the camera (usually 20+ ft), disconnecting the Camera from Capture App. We recommend staying within 20 feet of the Camera to maintain connectivity. Delete command does not completely delete Capture data from iPad, which can result in insufficient disk space to continue scanning. We recommend you back up non-essential data (i.e. music, video, other apps) using iTunes to free up as much disk space as possible. We recommend you read the updated Capture App 2.0 User Guide to learn more about the new features. If you have questions, contact us at support@matterport.com. Please be aware that live support will be available on a limited basis until September 24th. The following is the text of an email (19 September 2014) from the Matterport Team announcing the Matterport 3D Capture App 2.0 update. Now on iPad and Android! 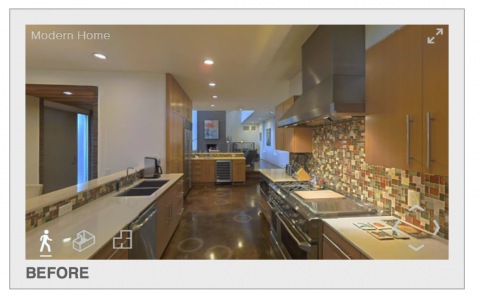 After much anticipation, we’re excited to announce that we have added touch controls to Matterport 3D Showcase, so 3D Showcase is now viewable on iPads upgraded to iOS 8 and Android tablets that support WebGL. We hope you and your clients enjoy this new feature. To see 3D Showcase on an iPad, you will need to update your iPad or iPad Mini operating software to iOS 8 and then access a 3D Showcase through the Safari browser. If you have any questions, please reach us at support@matterport.com. I'm going to hold off updating to 2.0 till I'm assured that Bluetooth and any other bugs are fixed. I regards to the player I've tried it on Android with no success. My iPad Air needs IOS 8 to view the viewer so until I know that IOS 8 won't have issues with Matterport I'm not upgrading. Reports so far stated that IOS 8 crashes when you do more then 100 scans. There may be other issues as well and I can't afford to take that chance as my iPad is used just for scanning. furthermore that figure of 100 is approximate. It's actually a little less...and crashing of the player has ceased, it can just stall and run slow and blurry. Dependent on many factors including Internet connection. Yep, no worries. Perfect move. Wish I'd held off but couldn't help but be a guinea pig...Have you used the player on an iPad yet? It's amazing! The following is the text of an email (30 September 2014) from the Matterport Team announcing improvements to My.Matterport.com and Matterport 3D Showcase. Collaborator Permissions. Admins can view and change permissions for each Collaborator on the Collaborator detail page on my.matterport.com. Manage Credit Cards. Admins can add credit cards and edit credit card information on my.matterport.com. Change Collaborator Email Address. Admins can now edit Collaborator email addresses. Folders and Models. Models in folders no longer also appear in All Models view. The service update will begin at 3pm PDT on Wednesday, October 1  and take approximately thirty minutes. We do not anticipate any interruption to the service. If you have questions, please contact us at support@matterport.com. We're excited to announce an important update – Matterport 3D Capture App 2.0.2, expected to arrive in the Apple App Store this coming week. [5 October 2014] In response to your feedback and our own testing, we have resolved a number of issues found in the 2.0 version of the App. -- Insufficient Disk Space. Deleted scans and models now fully delete, freeing up disk space. -- Alignment. We’ve fixed several issues that were contributing to alignment errors and subsequent stability problems. -- Connectivity. We have improved Bluetooth mechanics so you will see fewer warnings regarding connection issues. Thank you for your continued support, patience and helpful feedback. As usual, please upload all models before updating the Capture App. If you have questions, contact us at support@matterport.com. 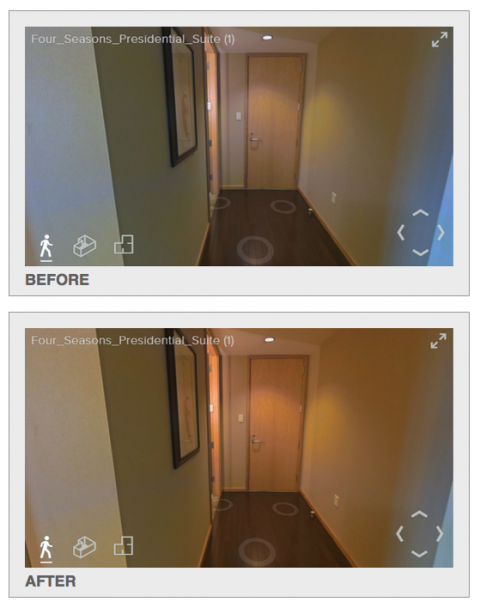 The following is the text of an email (8 October 2014) from the Matterport Team announcing viewing performance improvements. -- Much improved stability, especially on mobile. -- 3D Showcase loads faster on both desktop and mobile. -- Better overall responsiveness on both desktop and mobile. These improvements are already live. We invite you to send us your feedback at support@matterport.com. The following is the text of an email (13 October 2014) from the Matterport Team announcing the Matterport 3D Capture App 2.0.2 update. The Matterport 3D Capture App 2.0.2 is arriving in the Apple App Store tomorrow, Tuesday, Oct 14! If you're using Capture 2.0, we strongly recommend upgrading to 2.0.2, as it fixes a number of issues. As with all upgrades, we advise uploading all current models first. If your iPad is set to auto-update Matterport Capture, ensure you have your models uploaded first. Insufficient Disk Space. Deleted scans and models now fully delete, freeing up disk space. Alignment. We’ve fixed several issues that were contributing to alignment errors and subsequent stability problems. Connectivity. We have improved Bluetooth mechanics so you will see fewer warnings regarding connection issues. Thank you for your continued support, patience and helpful feedback! If you have questions, contact us at support@matterport.com. The following is the text of an email (15 October 2014) from the Matterport Team announcing the Matterport 3D Capture App 2.0.2 update. The Matterport 3D Showcase Processing System will be updated on Thursday, October 16th. All models uploaded after the update will be processed using the new visual processing improvements. -- Whites will appear truer to life, providing an overall more accurate 3D Showcase visual. -- Scans that currently appear saturated in one particular color will now be more balanced. -- There will be greater consistency between neighboring scans. Thank you for your continued support and helpful feedback! If you have questions, contact us at support@matterport.com. The updates for viewer on iPad have been great, now I'm able to show clients real examples during my listing presentation without bringing my laptop. The iPad is very intuitive and allows them to get hands on feel for what we offer at no additional charge, that currently no other realtor has. We encourage you to read our updated policies below. The following is the text of an email (6 November 2014) from the Matterport Team. The Matterport 3D Showcase Processing System will be updated on Thursday, November 13th. All models uploaded after the update will be processed using the new visual processing improvements. The improvements are anchored in our handling of brightness in 3D Showcase. Model lighting will be truer to actual conditions, and should be most noticeable in ceilings that previously looked darker than expected. See below for samples. Thank you for your continued support and helpful feedback! If you have questions, please contact us at support@matterport.com. 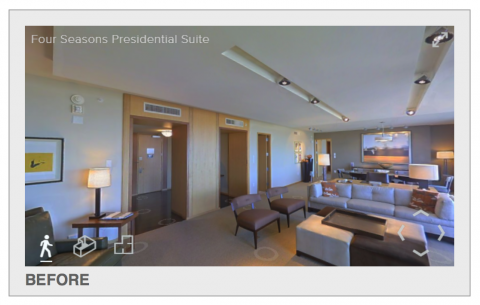 Copyright © 2014 Matterport Inc. The following is the text of an email (14 November 2014) from the Matterport Team. We upgraded our 3D Showcase processing system yesterday to enhance the brightness and consistency of 3D Showcase model lighting. Under certain lighting conditions, we found that the changes resulted in models that appear too bright. Accordingly, we have decided to reverse this update. For customers who uploaded models during this period, we will be reprocessing your models at no expense. These models will appear in your account by Monday, November 17th. The following is the text of an email (21 November 2014) from the Matterport Team. Google recently released Chrome version 39, which you may notice in your browser's periodic updates. However, please be aware that this version of Chrome is not yet compatible with the Unity plug-in we use to power Workshop. If you are a Mac/OSX user you will need to use a different browser (e.g. Safari or Firefox) to access Workshop until Unity releases an update that allows their plug-in to work on Chrome v39. Matterport 3D Showcase is not affected by this update and will continue to work in Chrome. Again this only applies to Mac/OSX users who are trying to access Workshop on Chrome v39. We are in touch with Unity and will notify you as soon as their update is ready and the issue is resolved. The following is the text of an email (24 November 2014) from the Matterport Team. The Matterport Capture App 2.0.3 is arriving in the Apple App Store on November 25th! We recommend upgrading to 2.0.3, as it includes a number of improvements. As with all upgrades, we advise uploading all current models first. If your iPad is set to auto-update Matterport Capture, please ensure all of your models are uploaded first. Easier connection to the Matterport Camera. It is now easier to connect to the camera and remain connected. Bluetooth is no longer part of the connection process – you can connect to the camera by connecting to the camera’s wifi only. You can also expect expanded range between camera and iPad. Please note that the Bluetooth light on the camera will now be permanently lit when the camera is on. Bug fixes. Mark Features now works on Re-uploaded models. The following is the text of an email (26 November 2014) from the Matterport Team. In celebration of the Thanksgiving holiday on Nov 27, Matterport will be closed, with no support available. Limited support will be available on Friday, Nov 28. Support will return to normal on Monday, Dec 1. The following is the text of an email (1 December 2014) from the Matterport Team. We’re excited to release Workshop 2, which will be available after 3pm PST tomorrow, December 2nd. The all-new Workshop is the content creation and content management application that defines the 3D Showcase experience. Over the next several months, additional updates to Workshop will be released that will continue to add functionality for 3D Showcase. * Set start location. Set your Showcase start location in Workshop. You will need to create a new Gallery image in Workshop in order to enable start location in Showcase. * Disable scan locations. Scan locations disabled in Workshop will not be displayed in Showcase. * Label rooms in Floorplan view. Use labels in Workshop to define rooms for your floorplan images. Labels will not appear in Showcase in this release. * New management panel. Easily manage scan locations, annotations, and gallery images. * New user interface. Overall improved user experience for editing your models. Navigation and stability in Showcase have also been improved. Reminder: For Google Chrome users on Mac/OSX, please use an alternative browser, such as Safari or Firefox, to access Workshop 2. We’re still waiting for Unity to release a new plug-in. If you have questions, please contact us at support@matterport.com. The following is the text of an email (11 December 2014) from the Matterport Team. 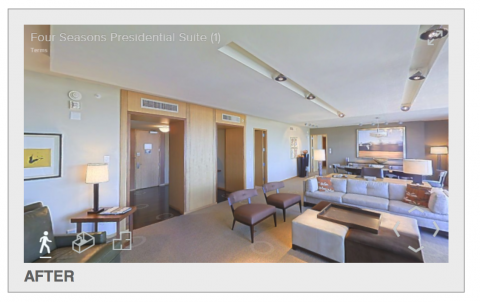 The Matterport Workshop is now accessible on Chrome v39 for Mac/OSX users. You will need to download the new Unity plugin to launch the application. Click here to download. Restart Chrome once installed. The following is the text of an email (17 December 2014) from the Matterport Team. Happy holidays! Please note that during the holiday period beginning Dec 19 and ending Jan 5, Matterport will be providing limited support. There will be no support available on Dec 24, Dec 25, Dec 31, and Jan 1. Otherwise, we will try to respond to support requests within 1-2 business days. Please note that this includes urgent support calls. Normal support availability will return on Jan 5. Enjoy the holidays, and we look forward to working with you in the New Year! The following is the text of an email (23 December 2014) from the Matterport Team. 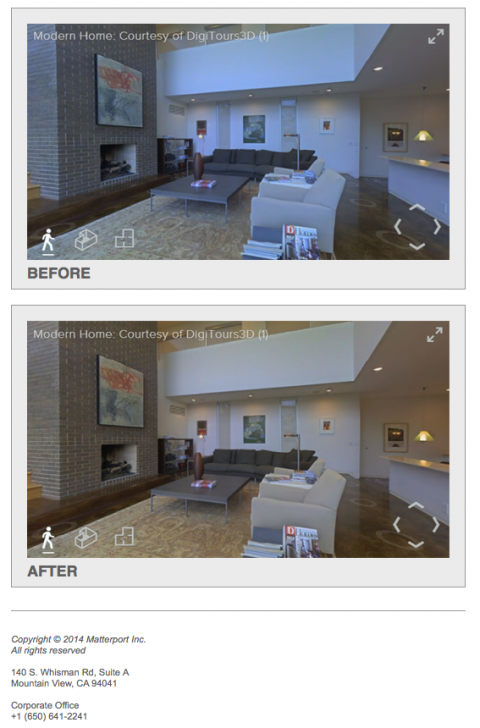 As you may know, Matterport Cloud Service Plans provide a specified number of free models each month – and models processed beyond that amount incur a $19 processing fee. We have not enforced processing fees to date. However, starting January 15, 2015, our $19 per model processing fee will apply once all free models each month are utilized. You’re welcome to review our complete pricing structure here. Unused model allotments cannot be carried over. Editing and re-uploading models will continue to be free. Historically, Matterport Cloud Service Plans have been billed on the 15th day of the month following your purchase. Beginning February 1, 2015, based on customer feedback, the new monthly billing cycle will begin on the 1st day of the month following your camera purchase. Cloud service plans will be billed at the beginning of the calendar month and accumulated model processing fees will be billed at the end of each calendar month. In order to accommodate the change, we will bill a half month of cloud service and any applicable processing fees for the gap period of 1/15/15 to 1/31/15. Your full monthly allotment of free model processings for January will be honored during this 16-day period. The change to monthly billing will not affect current, Annual Cloud Service Plans. However, subsequent yearly renewals will begin on the 1st day of the month following the expiration of the current plan. The following is the text of an email (12 January 2015) from the Matterport Team. My.Matterport.com will undergo maintenance this Wednesday, January 14, 2015 for approximately four hours starting at 11am PST. This update is strictly to improve back-end systems and won't have any impact on front-end functionality. During the maintenance period, access to My.Matterport.com will not be available and models uploaded to My.Matterport.com will not be processed. Please wait to upload models until after 3pm PST. Embedded models on websites and direct links to 3D Showcase that are set for public viewing will remain functional during this timeframe. There will also be no effect on the use of Capture itself. We appreciate your patience. If you have questions, please contact us at support@matterport.com. The following is the text of an email (11 February 2015) from the Matterport Team. Doing your first few scans on site can be a learning process, so we've made a video to make it easier! This short clip will cover everything from prepping the space to handling stairs and new floors, and may even give veteran users a new tip or two. We hope you enjoy it, and we will be creating more how-to videos soon! The following is the text of an email (18 February 2015) from the Matterport Team. A new release of the Matterport Capture App (2.0.5) will arrive in the Apple App Store on Thursday, February 19th. We recommend that you upgrade to this new version as soon as possible to take advantage of our latest firmware and feature updates. Thank you for your continued support. If you have questions or feedback, feel free to contact us at support@matterport.com. 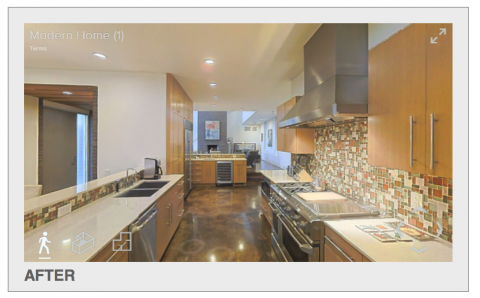 Copyright © 2015 Matterport Inc.
Has anyone updated already? I would rather know it works first before I do it. I have always regretted updating operating systems on my apple devices. The following is the text of an email (25 February 2015) from the Matterport Team. We're pleased to announce an update to My.Matterport.com portal, available on Thursday, February 26th. We’ve added content and collaborator management features to the portal for users with Administrator permissions. Delete Models. We’ve added the ability to delete models. Please note that once you’ve deleted a model, you cannot undelete it. Delete Folders. Folders can now be deleted. Deleting a folder will delete all models and all subfolders within that folder. Please note that once you’ve deleted a folder and its contents, you cannot undelete the folder or any of its contents. Delete Collaborators. Collaborators can be deleted from an account. Please note that once a Collaborator is deleted, the user will no longer have access to your account at My.Matterport.com. We hope these new features will help you better manage your account. If you have questions, please contact us at support@matterport.com.